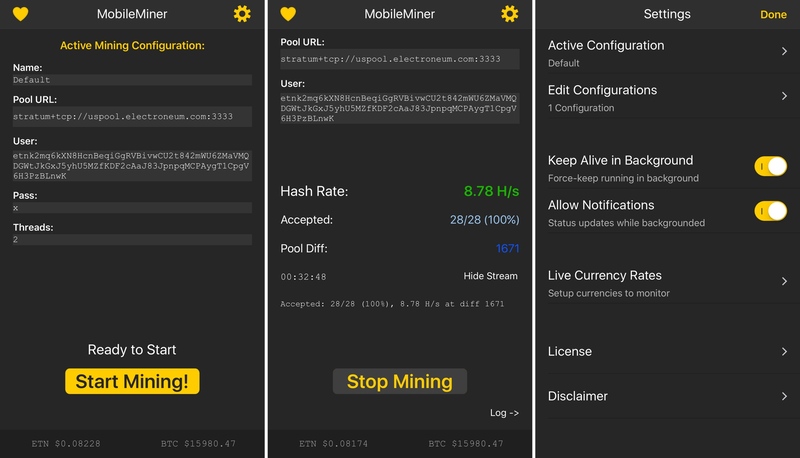 MobileMiner ipa iOS turns your phone into a electroneum mining machine. It works without jailbreak. Whatever you earn, its one percent will go to the developer. Considering that, the amount you earn will be not that much because mining requires very high rigs which your phone cannot give. You will be only making a small chunk of money. Which you can hardly withdraw. But its a fun to do thing. And it is completely free. Do you know that now you can jailbreak your iPhone with liberios. If you are serious. You want to mine cryptocurrency with your iphone. Then consider below things before you start mining with Mobileminer ios app. Electronium Mining requires a lot of power and processing. Your phone’s battery will completely drain in apprximately 3 hours with constant mining according to Limneos the developer of this tweak. Your phone will mine at per unit rate of 40H/s if you have and iPhone with 64 bit processor. That will make you about 0.12$ in 24 hours. And this is not profitable at all. Moreover, it is not recommended to mine for a long time. This will be intense of phone hardware and drain battery resulting in decreasing the battery lifespan also. Apart from all these above points, you can use mobileminer for iOS but just for testing and fun purpose. If you plan to use it on long term then you better prepare for your phone’s funeral coz it’s intense baby. To download mobiminer ipa on iphone or ipad. You can install the ipa file from below links and then install it using cydia impactor. After that follow the installation steps. Click on the links below to download mobileminer cryptocurrency mining for iphone or ipad. 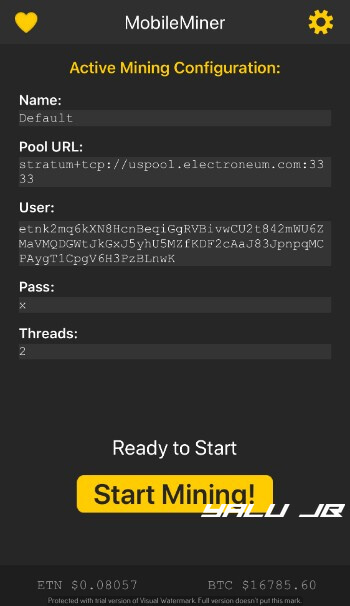 Do these steps to install mobile miner electroneum mining on your phone. Download mobileminer ipa file from above link on your computer. Download Cydia impactor and install on pc or mac. Now connect your phone to computer. Drag the mobileminer iOS ipa file on to cydia impactor. Mobileminer will not start installing. When it install completely. Dsiconnect the device. Go to settings>>general>>Device manager and trust the profile of recently install miner app. Launch the app and start mining bitcoins. Your phone is now bitcoin mining iOS machine. So, do you like mobileminer ipa for iOS. Share you thoughts in the comments below. Subscribe to for more awesome ipa tweak apps.